Astronaut David Wolf attaches a camera to ISS with help from Canadarm2 on a 2002 EVA (Credits: NASA/Science Photo Library). Astronauts and cosmonauts living on the International Space Station will perform two spacewalks in August. On Monday, August 20, the first team, a Russian duo, will conduct their spacewalk, followed ten days later, on August 30, by a second team – an American and Japanese astronaut. These are the only planned extravehicular activities (EVA) for the current Expedition 32 mission. A spacewalk or EVA is an activity outside of a space habitat in the vacuum of space performed by astronauts. During this mission the astronauts wear a special space suit to protect them from space environment and provide them with a life support system which supplies breathable air, food, and water and maintains a stable temperature. These upcoming extravehicular activities will be the 163th and 164th conducted in the course of assembly and maintenance of ISS. 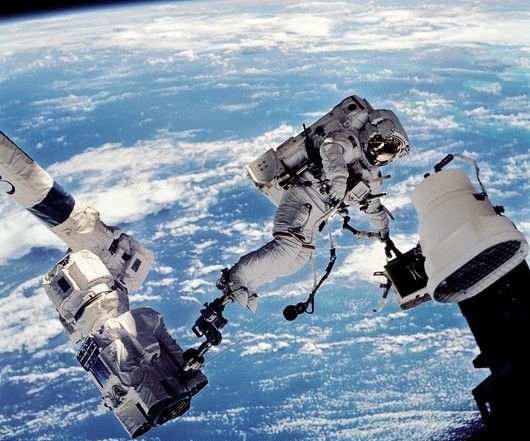 According to NASA, the first spacewalk is scheduled to last approximately 6.5 hours, beginning at 14:40 GTM. Cosmonauts Commander Gennady Padalka and Flight Engineer Yuri Malenchenko will relocate the cargo crane from the Pirs docking module to prepare for installation of the new Russian laboratory unit, scheduled for launch in 2013. The second task of the cosmonauts will be to install debris shields to protect the Russian Zvezda service module. The second spacewalk, scheduled to begin at 12:15 GTM on August 30, will be conducted by NASA Flight Engineer Sunita Williams and JAXA Flight Engineer Akihiko Hoshide. During this second excursion, these astronauts will replace a faulty power module and will run cables outside the station to prepare for the new Russian laboratory. They will also install a new camera on the space station’s robotic arm among other things. Three of the four spacefarers are veteran spacewalkers, with Hoshide the only crew member who will be participating in his first EVA. All four are reporting that they feel well prepared for this step outside the station and will be able to fulfil their list of tasks. The amount of time spent on each task will be monitored by ground control as it is important that the astronauts maintain their schedule in order to complete all of their activities.